Woah!! A GPS based Speed / Safety camera warning device for under £80? This can't be right. How can Toad make and sell a unit for this price when RoadAngel, Snooper, etc are selling their GPS systems for over £250!!! You can tell the ordinary motorist is getting fed up with Speed-Cameras when Woolworths start selling these devices - thats where I first saw the Inforad system. Looking like a plastic fag packet with a couple of LEDs on the top, I wasn't too confident it could do the job. How wrong could I be? I got my hands on an Inforad to test a few months ago after my Dad bought one from Lidls (!) and he was raving on about how good it was, warning him about all the cameras on his daily 50 mile commute. Intrigued, I borrowed the Inforad, complete with cigar lighter lead and another piece of velcro to stick it onto my dash. A quick browse of the instructions and I was off in search of my local cameras. At this point I should point out that this Speed Camera Detector will work with 12v or 24v. You get 6 months worth of free map updates to download and then you can pay a very reasonable fee for the next year. Ok, I'm on the road approaching our local Truvelo Camera. As the instructions stated, with about 20 seconds to go the Inforad LED turned red and the unit bleeped at me. Because I was travelling under the limit the unit stopped bleeping, with the LED staying red. I then went onto a place where a Safety Camera has recently been removed, and gunned past it over the speed-limit. The unit kept on beeping to warn me, which was exactly what it should have done. Determined to try and find some Cameras the Inforad didn't know about I went to our local bug city, and the Inforad warned me of all of them. Great!! So, what are the down-side to using this budget GPS speed-camera detector? Well, it has no laser detector, so you're vulnerable to mobile patrols, and as far as I'm aware the Inforad database has no plans to include them. The warning system is very basic, but I have to say it does work well. 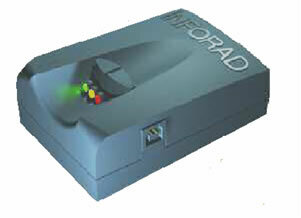 I looked at a few other reviews to get other opinions, and they all said the inforad was a good system, but that it had missed some fixed position cameras. My conclusion is that the Inforad is a great little budget Camera Detector, it has its flaws, but for the average car driver it works fine. If I was a professional driver, or my livelihood depended on my driving licence I think I'd still splash the extra cash and get a RoadAngel Plus or an Origin B2. I bought this from woolworths on a whim really, not expecting the great performance it gives, all my passangers remark on it being so basic and so effective, it's the best 70 quid I have spent, and saved me a fortune!! Julie. I've been using this particular model for two years now and what a great gadget it's been - never let me down yet and saved me a fortune in fines and points! If you read the instructions, it's programmable to suit approach distances and distances after cameras, it can be set to camera direction (Gatso get you one way only)and not only does it warn you of impending cameras but it also warns you if you are over the speed limit for that particular stretch of road. Add to this the fact that it can store a log of journeys, showing distance, time and average speeds but it also lets you programme in points of interest and locations of other cameras that you may not have updated. All in all a great piece of kit & great value for money - no driver should be without it. I have just upgraded to the newer model without hesitation. Thanks Inforad. Phil.